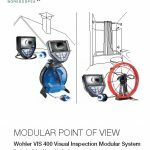 Modular by design, it is possible to combine the Wohler VIS 400 Visual Inspection System with a variety of camera vipers, camera cables and camera heads. 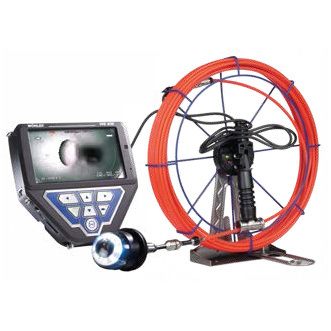 For instance, simply connect either the Wohler 2" diameter or the 1 1/2" diameter pan & tilt camera head to carry out a variety of inspections. Both of these cameras pan 360 and tilt 180 while offering the best possible lighting. 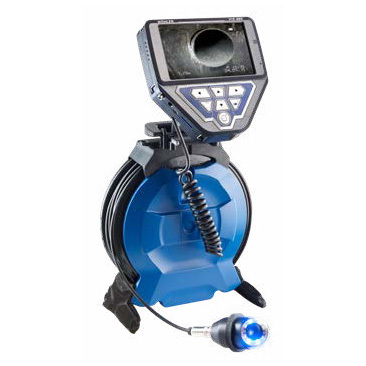 After panning and tilting, the home function automatically aligns the angle of the 1 1/2" dia color camera to straight ahead with a simple push of a button. 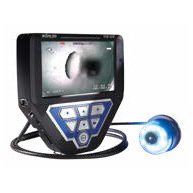 View, speak and save The Wohler VIS 400 will make a video recording of the inspected line run. When damage is discovered, begin the voice recording function to annotate the recording. As well as recording video, you may also take and save still photos at the press of a button. without pouch: 8" x 8" x 2"
with pouch: 9" x 9" x 3"